G E Street, attributed possibly for the Law Courts. A wrought iron standard lamp. The first set of images are before it was restored. The second set painted black using powder coating so it will withstand outside use if desired. A large wrought iron chandelier, 1970s. 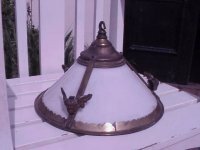 A rare Arts and Crafts circular and copper light with repousse circular details and hand riveted details to the upper section with a flaring canopy holding a dome shaped Vaseline shade. Height 8 1/4" , Width 17". Circa 1900. A good quality pair of Glasgow School brass ceiling lights with winged Angels faces. Width 20", Height 36", which can be adjusted with the chains or with the hanging wires", Width of Angel from wing tip to wing tip 8 1/2". Circa 1900's. An Art Nouveau chandelier retaining the original Vaseline shades with swirling details entwining around each of the three arms and organic foilage surrounding a lower elongated swirling finial. Height from top fixing to bottom finial is 40", but could be made shorter if required. Width across arms 24", Vaseline shades are 5" high. Circa 1905. An impressive French Vaseline hanging light with individual stlyised floral decorations. Height 13", Width 9 3/4". Circa 1900. A GEC Arts and Crafts brass three branch ceiling light re-wired in period style cable. A pair available, I will sell seperately. Height 37", present chain length 10". Width from arm to arm 18". Circa 1900's. An Arts and Crafts three branch ceiling light with petal details to each light fitting. Height 14", Width 15". Circa 1900's. Height 7", Width of base 5". Circa 1900's. A rare pair of Arts and Crafts ceiling lamps, hand hammered and hand formed with hand wheel cut glass bowls retaining their original ceiling roses. length of light 18", Width of light 10", length of chain 24". Circa 1900's. A good quality pair of Arts and Crafts three branch ceiling lights in the style of WAS Benson. A circular brass Arts and Craft ceiling light withpetals to the top. Retaining it's original ring to the bottom to hold in place a circular shade. Height 19", Width 18". Circa 1900. An Arts and Crafts Orb ceiling light, skillfully made with a sphere shaped central body, which encorporates the hanging wires as part of it's design. Height of Sphere 9". Width of sphere 12". Circa 1900. 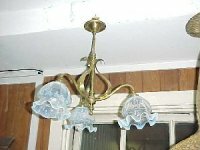 A good quality Arts and Crafts three branch brass ceiling light. Approx Height 18" , Approx Width 20". Circa 1900. A hand hammered Arts and Crafts copper rise and fall ceiling light with three bulb fittings. This rise and fall moves to any height you require. Circa 1900. An Arts and Crafts three branch ceiling light. Length from ceiling 21" without a chain so it could be made to hang lower if required. 14" across the arms. Circa 1900. The last three images are before it was re-wired. An Arts and Crafts Copper three branch ceiling light with stylised floral pod details in the style of WAS Benson. 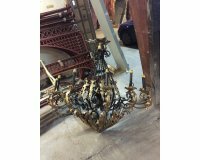 A good quality Gothic Revival brass ceiling light. Width 14", Height 28", Width across the circle 21". Circa 1895. Faraday's and Son makers London. A period brass light fitting with winged Cherubs retaining it's original white glass shade retained by brass outer rings. Brass label, 'Sir David Solomon's patent attached'. Height 8 1/2" and the Width across the flats is 12". A set of three Arts and Crafts brass floral leaf ceiling lights, with their original back plates, ideal for a low ceiling. Height 3" , Width 6". Circa 1900. An Arts and Crafts copper floral leaf ceiling light, ideal for a low ceiling. Height 1" , Width 8". Circa 1900. 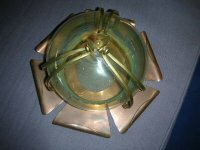 An Arts and Crafts brass ceiling light, re-wired ready to use. Perfect for a low ceiling. Height 5" and 6 3/4" across the base. Circa 1900. 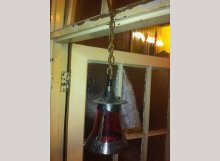 An Arts and Crafts copper hanging light with original glass bowls. Hanging chains to three curled hooks with central leaf details to the top glass bowl. Height 38 1/2" (the chain could be shortened for a higher drop, Width at bowl 12", Height from Leafy detail to bottom of bowl 12". Circa 1900. 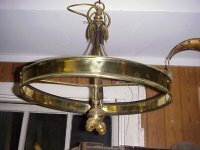 An Arts and Crafts brass three arm ceiling light. The vaseline shades are sold. A stylish decorative wrought iron adjustable floor standing candelabra with copper stylised heart appliques. Height retracted 51", Height fully extended 80", Width at base 20". Circa 1900's. A French hand wrought iron standard lamp in the style of Edgar Brandt, retaining it's original shade signed Snider . Circa 1905. Attributed to the Birmingham Guild of Handicraft. A brass and iron standard lamp with stylised floral scroll details. Width at base 22", Height 65". Circa 1900. 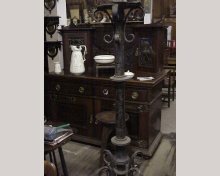 A very stylish hand wrought iron standard lamp attributed to the Birmingham Guild Of Handicraft. This has now been stripped back to the bare steel and polished. A tall pair of Arts and Crafts hand hammered copper floor or Knurl/Post lamps. Height 40", Width of base 10". Circa 1900. An Aesthetic intricately designed brass standard oil lamp mounted with glass bulls eye jewels on stylised floral stem, domed base with lions paw feet totally original. Height 22", Width across the arms 22". Circa 1900. An Arts and Crafts copper three branch ceiling light with three Turquoise Ruskin Jewels inset to the main body and three Peacock Feather Vaseline shades. The hammering of the copper is very particular by Richard Rathbone one of the finest Arts and Crafts metal workers of the period. A rare Arts and Crafts hand wrought iron standard lamp made The Birmingham Guild of Handicraft attributed to Arthur Stansfield Dixon with its original copper hanging lamp pierced to the domed top with hearts and Vaseline shade with a shepherds crook top flowing down to meet four supports united by arched legs and pad feet centred by a sphere. Height 40 1/2". Circa 1900. 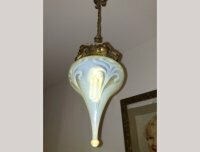 An Arts and Crafts ceiling light with original vaseline shade called 'The Malvern' as shown in the last image made by The General Electric Company. Approx Height 6", Width 11" by 11". Circa 1900. A Glasgow school wrought iron and copper standard lamp with stylised floral hand formed details and a lower copper band inset with three Ruskin jewels. A beautiful Vaseline ceiling light with brass ceiling rose and stylised floral mount to the centre of the wire and to the top of the shade. Height of chain and sconce 14", Height of shade 9", together 23", Width of shade 4 1/2". Circa 1900. I am always looking to purchase these big Benson lights. An Arts and Crafts ceiling light with green glass liner and stylised hammered strapwork with heart cut-outs. With Registered design number. A ceiling lamp with stylised floral hand formed details, inset with three Ruskin jewels. Width without shades 15", Height from ceiling 21" and the ring with the Ruskin's is 3" High. Circa 1900.